"Networking Europe" was a thematic research network under the ESF Network of Excellence Tensions of Europe. It ran from 1999-2005. Erik van der Vleuten and Arne Kaijser (Eds. ), Networking Europe. 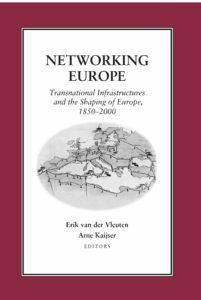 Transnational Infrastructures and the Shaping of Europe, 1850–2000 (Science History Publications USE, 2006). 335pp., illustrated, 0-88135-394-9. The working group built a research network and a research agenda to investigate the construction of Europe as a nework society, i.e. as a society shaped in interaction with the development of network technologies ('transnational infrastructure'). In this exploratory project, we particularly focused upon the conceptual and empirical study of transnational linking (or non/delinking) of infrastructure networks. In order to avoid a more or less determinist perception of infrastructure growth as an automatic process, we intended to be particularly sensitive to the conflicts and tensions around these processes. a synthesis project on Europe's Infrastructure Transition.